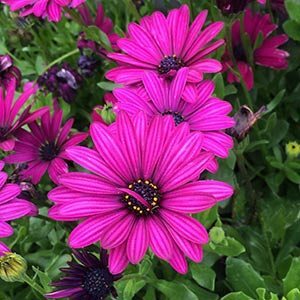 An old time favourite with a few new releases Osteospermum ecklonis are a colourful free flowering plant suited to growing in containers as well as in the garden border. These evergreen perennials are vigorous in growth habit , good green lightly toothed foliage and flowers that can be up to 5 – 6 cm across. Most have contrasting centres with petals ranging from white through to deep purples, blues and pinks. As long as humidity is not to high, these plants are virtually problem free. Try to keep water off the foliage in summer to help prevent fungal diseases. This is a plant that can be deadheaded to promote more flowers, and can also be pruned back in early spring to maintain a good bushy habit. Well suited to growing in containers, we suggest using a good quality potting mix and watering regularly with a liquid seaweed fertiliser. Height – 35 to 50cm with some cultivars to 1m. A few lower growing forms will reach only around 20cm in height. 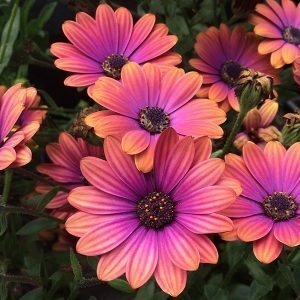 Flowering period – Osteospermum ecklonis will flower almost year round in good conditions, however Summer is the main flowering time. Flower colour – Blue, Purple, White, Yellow and Pink depending on cultivar. Foliage – Deep green and dense. Drought tolerant – Mildly once established, flowers tend to wilt if the soil becomes overly dry. Frost tolerance – Low to moderate. Container growing. – Yes suited to pots and containers.